If you've followed me for a while, you'll know that my skin is super duper pale! As a result I find it really difficult to find a contour shade that's not too warm and not too cool. When I seen that Seventeen (one of my favourite brands) had a contour kit, I picked it up straight away. I bought mine in Boots and it cost €8.49! So as you can see from the pictures, there's two pans in the kit, one for contouring and one for brightening. Both are powders. The packaging is nice, it's slim so it's easy to store and travel with, it's quite sturdy and it also has a large mirror on the inside. The pans themselves are also quite big which is great. I hate when companies make the pans a little bit smaller in order to fit in a brush (that no one ever uses anyway), so I'm glad Seventeen didn't go down that route. It also came with a little guide that shows you where to apply the contour shade and where to apply the brightening shade. Handy! 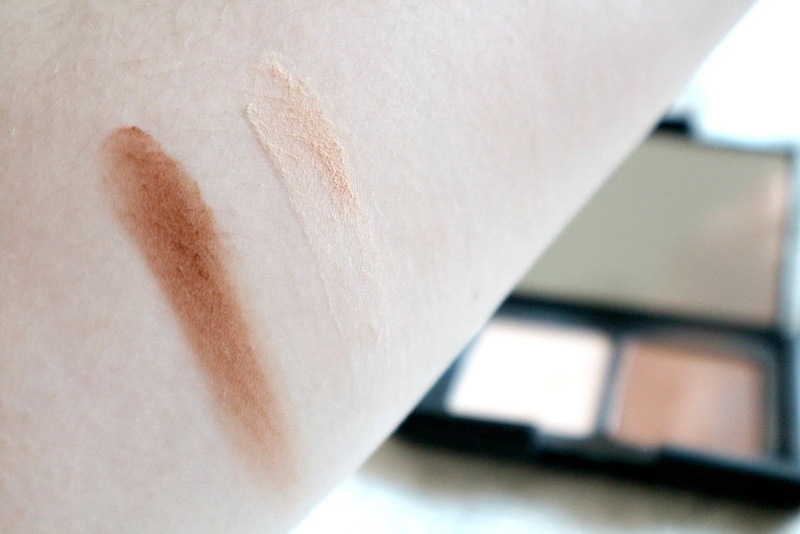 Above is swatches of the two powders. The contour shade works really well with my skin tone, both when I'm tanned and also when I'm pale (which is 99% of the time). It looks quite contrasting against my skin in the picture but when it blends out, it really is beautiful. The pigmentation is really good, it works well if you're looking for a natural look or you want to build it up for a night out. Whichever you prefer, it easily achieved with this powder. The brightening shade is quite nice too. I usually use it as a setting powder. I like applying it under my eyes as it's not a very heavy powder so it doesn't give that cakey look. All in all I really like it, since buying it, I haven't used anything else! The standout is the contour shade but the brightening shade is good to have in the kit as well. For €8.49 you can't go wrong with this little contour kit. It's a great size and performs really well. Seventeen also do offers quite regularly in Boots so it's no harm keeping an eye out for those 3 for 2 offers!